Below is information on the Embraer Phenom 100 Specifications, gathered from various sources. Type of certification: Part 23: Single pilot certified, VFR, IFR, day/night, known icing conditions and RVSM (Reduced Visual Separation Minimum) Federal Aviation Administration (FAA) Type Certificate: A59CE. Issued / Approved on December 12th, 2008. Applied on October 5th, 2005. Airplane is built by Embraer SA in Brazil or Embraer Executive Aircraft Inc. (under license) in Melbourne, Florida. The manufacturer can be confirmed by looking at the aircraft data plate. Most of the Phenom 100s are built today at the Melbourne, Florida facility. The aircraft must be operated according to the FAA Approved Airplane Flight Manual (AFM), part number AFM-2656 dated December 12, 2008 or later approved revision in the United States. Aircraft serial numbers 50000005 to 50000217 are the Enhanced Version. The placard in the cockpit / flight deck must be checked to determine the correct version for Phenom 100 serial numbers 50000218 and up. Passengers: 8 Persons max including pilot(s). 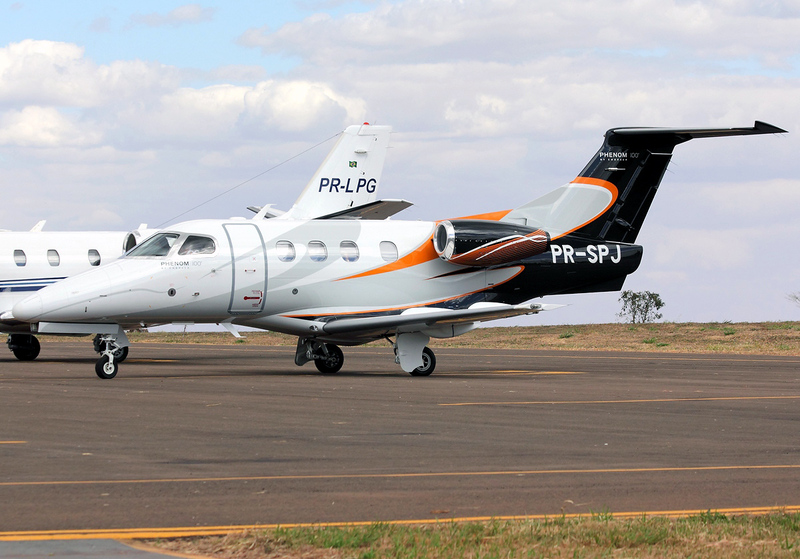 Official Name of the Aircraft is the "Embraer EMB-500"
Above Embraer Phenom 100 specifications page photo by Renato Spilimbergo Carvalho on Wikimedia Commons. Photo (only) released under the GNU Free Documentation License Version 1.2. Maximum Ramp Weight: 10,626 Pounds (lb) or 4,820 Kilograms (kg) with service bulletin SB 500-00-0009 1. 10,516 Pounds (lb) or 4,770 Kilograms (kg) without the SB. Maximum Takeoff Weight: 10,582 Pounds (lb) or 4,800 Kilograms (kg) with service bulletin SB 500-00-0009 1. 10,472 Pounds (lb) or 4,750 Kilograms (kg) without the SB. Maximum Landing Weight: 9,877 Pounds (lb) or 4,480 Kilograms (kg) with service bulletin SB 500-00-0009 1. 9,766 Pounds (lb) or 4,430 Kilograms (kg) without the SB. Maximum Zero Fuel Weight: 8,884 Pounds (lb) or 4,030 Kilograms (kg) with two service bulletins 2. 8,775 lb with SB 500-00-0005 incorporation or with an equivalent factory incorporated modification. 8,444 Pounds (lb) or 3,830 Kilograms (kg) without the SBs. Basic Operating Weight: 7,220 Pounds (lb) or 3,275 Kilograms (kg) 3. Previously was 7,132 Pounds (lb) or 3,235 Kilograms (kg). Embraer Phenom 100 Useful Load Weight: 3,406 Pounds (lb) or 1,545 Kilograms (kg) with current SBs. Previously 3,384 Pounds or 1,535 Kilograms (kg). Maximum Payload Weight: 1,665 Pounds (lb) or 755 Kilograms (kg). Previously was 1,312 Pounds (lb) or 595 Kilograms (kg). Maximum Usable Fuel Weight: 2,804 Pounds (lb) or 1,272 Kilograms (kg). Embraer Phenom 100 Maximum Usable Fuel Quantity: 418.5 Gallons (gal). 1 Needs SB 500-00-0009 incorporated or an equivalent factory modification. New aircraft have this incorporated. 2 Needs SB 500-00-0009 and SB 500-00-0005 incorporated or an equivalent factory modification. New aircraft have this incorporated. 3 With one crew member (pilot) and standard FAA configuration. Two wing tanks with 1,403 pounds or 209.4 US gallons of usable fuel for each tank. Oil Capacity (total): 4.00 US quarts (3.79 liters) tank mounted on each engine.